What’s New With Amoeba & Quilly? Well, Amoeba spent a week in Louisiana, came home for a few days and then flew off to Hawaii. He came home from Hawaii for a few hours — literally just long enough to get the clothes in his suitcase washed and repacked — and drove to Seattle where he is now. I have been busy, too, but not jet setting. I have been right here at home gardening and cleaning the garage. I had to clean the garage because we bought a second car. Well, it is sort of a car …. It is street legal and we have it licensed and insured, but calling it a car is kind of ambitious. It is a little electric Ford TH!NK Neighbor. I call it a buggy and I love it. It only goes 25 mph, but that is plenty fast enough in town — and one can still get a speeding ticket in it on many of our local streets. (No, neither of us have done so nor do we plan to). I told Amoeba I would happily trade him cars. He can have the Malibu and I will have the buggy. He said no — then he got in the Malibu and went to Seattle! Of course, going to Seattle in the buggy could be an ordeal since one would have to make at least 3 eight hour stops to recharge the battery along the way. And I am happy zip, zip, zipping around in the buggy. Kay, I wouldn’t advise this for heavy traffic. It is a light, little, sprinter made for “neighborhood” trips. It is very small and won’t fare well in a collision. This is a fun car, Quilly! 🙂 It won’t need air conditioning that is for sure! Do people use them in the winter too? I am sure it has a side curtain to keep the cold winds out. Probably no heater though. It reminds me of the Vespa motorscooter I had in the service. It gave us two car luxury. What a fun ride this cutey would be on local streets! Some folks have golf carts that they drive around the neighborhood; those are not street legal though. 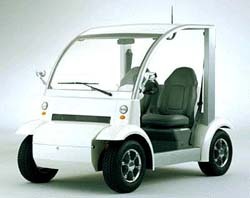 They need something like this to drive to Walgreens and Dominicks which are just outside of our development because our newsletter often prints a reminder that golf carts are not legal outside our gates. Cool! We could need those type of vehicles here. They would really be useful. I can just imagine you driving it. I have always wanted something like this to dart around our property and through the local neighborhood. I didn’t know they made these street legal. I’ll bet you see alot of them in Florida (the retirement capital of the world!). What a cute little buggy. It would be awesome to be able to use something like that for short little trips to the store and the like, but we’re not set up for that. I’m wondering if our mountainous terrain might not also be a problem. What a beautiful car !!!! I am jalous ! I want the same !! Nice to hear that you are well and A. jetsetting not around the world fortunately but around the States ! Keep your washing machine on for the next stop ! What a cool gizmo. Congrats. I can see you scooting around the streets of Friday Harbor in that. You are going to enjoy it. Too cute! Is this the one with the tail-light problem? It’s so adorable. I want one too!